Lincoln Electric, a world leader in the design, development, and manufacturing of a variety of welding and manufacturing equipment, had its sights set on FABTECH in order to introduce the brand’s acquisition as well as new techniques for welding and machinery. 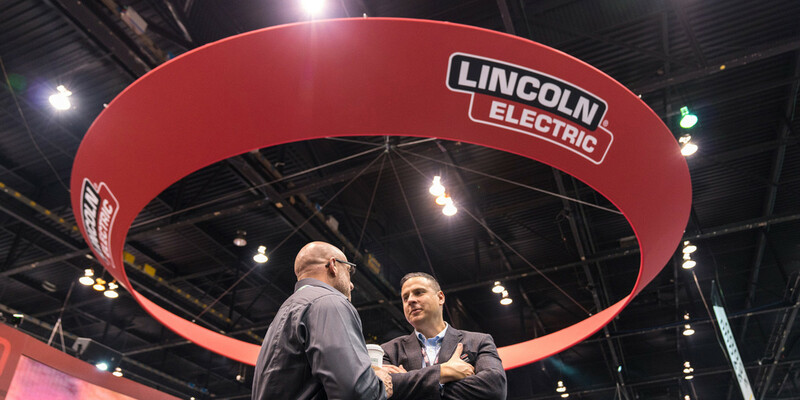 With nearly 45,000 attendees descending upon Chicago for the trade show, and a massive 14,000 square foot exhibit booth to put together, Lincoln Electric wanted to ensure a seamless and easy move-in process to set the brand up for trade show success. Because Lincoln Electric had such a large booth, the brand wanted its space to drive home key messages around welding and cutting, as well as have a place for its resale area. There needed to be a sense of organization and flow, along with room for all of the heavy-duty machines to shine and be shown off. This would require a tremendous amount of logistics during move in due to the complicated electric, graphic, structural, and machine schematics. With a short time to load in electric, graphics, AV, and over 30 various machines, Lincoln Electric turned to the Floorprint by Freeman™ solution. A full-scale installation plan, printed on layers of low-cost banner material and numbered or color-coded, was placed across the exhibit space floor. The first layer included electrical drops. Subsequent layers provided a blueprint for the placement of physical structures, signage, and more. This ensured that electricians and install labor crew could quickly place each exhibit component and get it done right — the first time — saving both time and costs. By utilizing Floorprint, the Lincoln Electric team could rest assured that every element of the brand’s dynamic 14,000 square foot booth would be in the right location, letting them focus on preparing for several successful days of exhibiting. Everything from electric, carpet, AV, graphics, structures, and beyond was accounted for. Floorprint not only decreased the possibility of mistakes being made on a limited timetable, it also helped save up to 20 percent in labor costs.